Protect your skin from the harsh rays of the sun and look super stylish while you're at it in this vintage inspired one piece swimsuit from Tall Poppy Surf. A super cute yet thoughtful and practical swimsuit for you or your teenager. These surf suits are meant to wear over a bikini. They are an easy on and off option to give you plenty of stay-on power when in the surf, supping or rowing. They're fully lined, and the fabric is soft and slightly thicker than most. Made from recycled materials and with a UPF 50+ and Chlorine Resistant rating, there is a lot to love about this unique swimsuit offering. 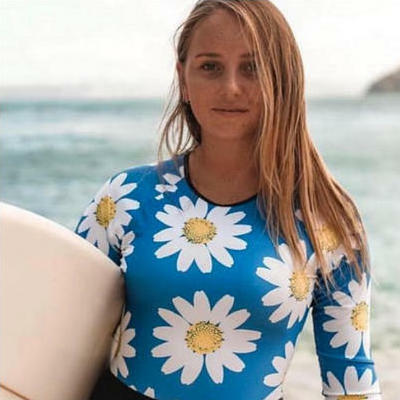 We love Tall Poppy Surf, a great little label from Qld that is custom made! Yep! Poppy can make what you like mixing up the prints and plains, tops and bottoms that can be made to fit your size 6-16 shape. So if there's something in the range that you'd like Contact Us and we'll help work it out for you. -Raglan long sleeves - for sun coverage on the shoulders and decolletage. -Lined front all the way through. Designed for you to wear a bikini top underneath for support. Limited sizes available in this hand made range; Size 8 available now. True to size.